Darth Vader Wood Cutting Board | Nerd Much? It seems almost unfortunate that his story ended so quickly. For the Star Wars fan that needs that extra nerdiness in their kitchen, this Darth Vader Wood Cutting Board is going to bring any meal to new heights. They don’t mention what kind of wood the board is made out of, but they do say that the Darth Vader head is inlaid into the wood. For those that may not know, that means the shapes were carefully cut out of the lighter wood, a dark wood was inserted, and everything was glued together. As such, keep in mind that this cutting board is hand wash only. The heat of the dishwasher will not only damage the wood, but likely melt the glue. Everything will look terrible, don’t do it. There’s no returning it after you’ve open the plastic either, so you have remember that it can never go in the dishwasher. There’s even a warning on the back to remind you. For those of us with slippery counters, there are no grips at the bottom of this board. If you don’t want this sliding around while you slice and dice (because I doubt it’s heavy enough), I highly suggest buying small plastic or rubber feet to stick to the bottom. 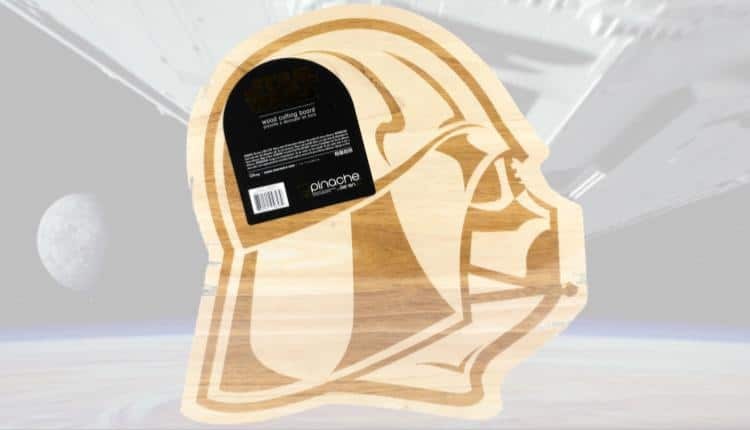 The Darth Vader Wood Cutting Board is priced at $24.99 USD, a usual price for most speciality cutting boards. It is a little expensive if you’re on a budget, but it is on the bigger side of most cutting boards at 14 inches by 14 inches and .75 inches thick. While you’re on fun.com, there are plenty of other nerdy gifts to find. You can go all the way with the Darth Vader theme, as they also have a Darth Vader Waffle Maker (eat the face of evil for $34.99), a Darth Vader Toaster (giving a whole new meaning to the Dark Side for only $39.99), and plenty of mugs and tumblers for nerds on the go. Darth Vader is certainly one of the most iconic characters in the world, and very often hard to miss around the holidays. It seems almost unfortunate that his story ended so quickly and now we have the angsty Kylo Ren. Who the better villain is, is a question for the true Star Wars fans. Those who would buy a cutting board in the shape of Darth Vader’s head.